While Congress is on summer break, most senators and representatives attend publicly announced public meetings at which they speak about their work and hear comments from, and answer questions from, their constituents. 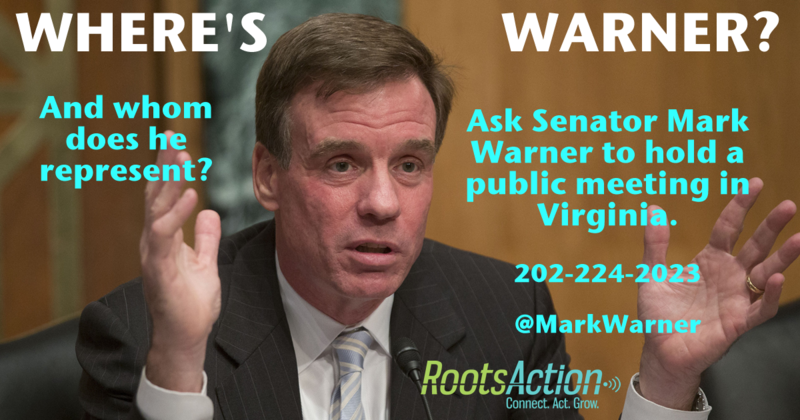 Warner could play a decisive role in upholding or rejecting the Iran deal (on which he has taken no public position), the Trans-Pacific Partnership, the Atlantic Coast Pipeline, and all sorts of other projects of critical interest to the people of Virginia. But where is he? His staff says he's holding only unannounced, closed-door meetings. Click below to ask him to appear in public.